Wedad Ftieta, 52, was married in July of 1983. “I was three months pregnant when he was captured. We are from Benghazi. My husband was born in 1955 and went to England to study electronic engineering. When he was in England he joined a students union against Gaddafi. It was secret and the government didn’t know about it so he was still able to return to Libya. He came back in April 18th, 1986. Twenty days later, he was captured. After they captured him, I didn’t know where he was until 1988. That year I was able to visit him. I found out he was in the prison by word of mouth. On my first visit, I brought our son. I tried to see him once a month. When I went to visit him, they humiliated us. They would throw my food on the ground and watch me collect the pieces. I was given 10 minutes per visit. There were signs of torture on his body, but he never said anything about it. I heard they would leave men alone in a room with a wild dog to attack them. He lost a lot of weight, I felt huge around him. My last visit with him was in May of 1996, less than a month before the massacre. He told me the prison was spooky and gray and that there was something going on. The visits were stopped after the massacre. I heard there was shooting, but no one knew anything. In 2000, his case was taken to court. There were five other men who he was being tried with. The five men were present, but he was not there. The five men, and Ahmed were given life sentences. After 2000, we were allowed to visit again, but I never got to see him. The guards started to give me letters from him, that he needed money, clothes, food and medicine. In the letters he asked how the family was and wrote that I could write freely to him. All the women could visit their husbands, but I couldn’t. In 2002 the men who he was tried with were released. They told me that they hadn’t seen him since 1996. In 2009 prison guards told me that he was going to be freed. During that time, I was preparing for my sons wedding. We pushed it back to wait for his release. I was always waiting for him, and thought he’d be released one day. I was waiting, dying for Tripoli to be released. But it was very sad for me when all the prisoners where released from Abu Salim prison. Only after Tripoli fell did I know that he was really dead. I can’t believe I have been waiting for my husband who died in 1996. I’ve lived in hope for such a long time. 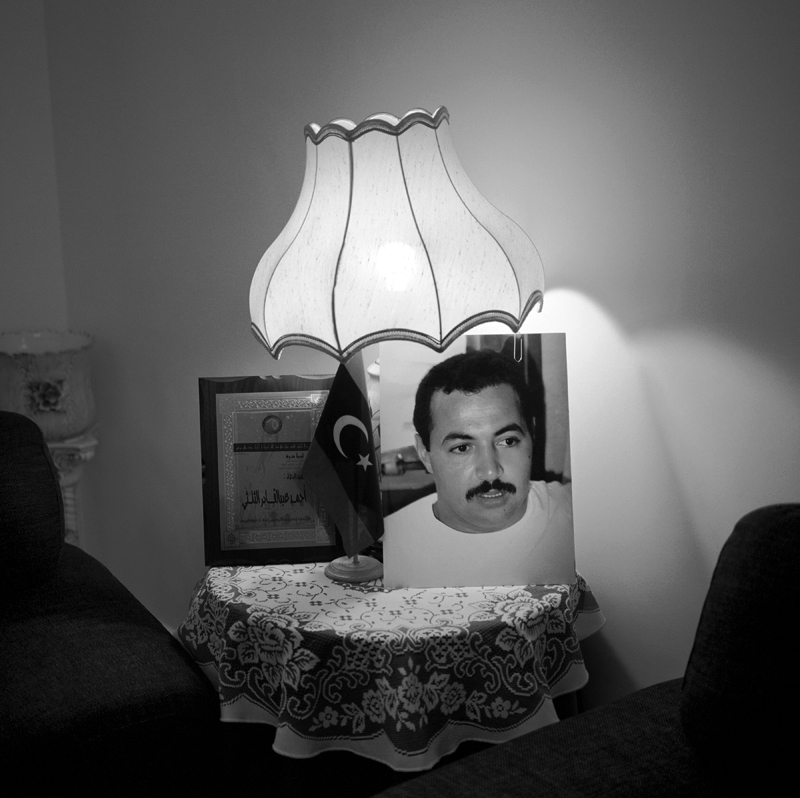 Ahmed died a martyr for this revolution.” On April 4th, 2012 in Tripoli, Libya, a photo of Wedad's husband Ahmed sits on a table in the living room of her son's house where she lives.